In a culturally driven country like ours, festivals are big occasions for the family to get together and celebrate. It’s part and parcel of our lives. Another one of those auspicious occasions is Akshaya Tritiya, also known as Akha Teej. It is considered as a lucky day for Hindu and Jain people, and falls on the third Tithi (Lunar day) of the bright half (Shukla Paksha) in the month of Vaisakh. It is believed to be the day Lord Parasurama was born, who is the sixth incarnation of Lord Vishnu. Akshaya literally means infinite, or that which shall never recede/reduce. This very day, Lord Ganesh and Ved Vyas started writing the Mahabharat, the great Indian epic. 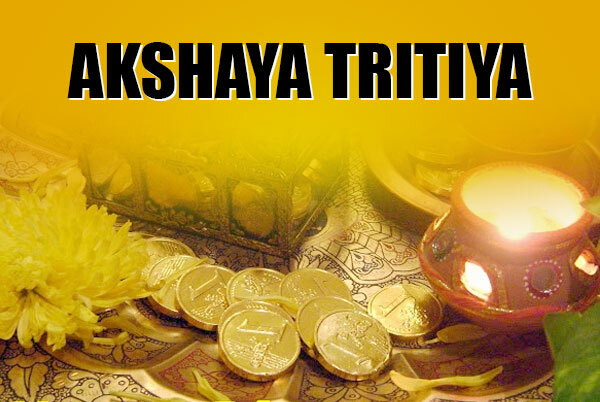 Akshaya Tritiya is particularly auspicious for buying gold. It is believed that gold or golden ornaments which are bought on this particular day would mean that the wealth and fortune would never diminish. Jewelry sales on this particular day shoot up as people flock the stores to buy jewelry items. It is an ideal gift item as well. Most people prefer buying jewellery with religious pendants like Ganesh, Om etc. Lord Ganesh and Goddess Laxmi idols are special favourites on this particular day, as they are responsible for bringing wealth and prosperity to one’s life. It might be a wise idea to buy gold coins as well. The Akshaya Tritiya gifts on this particular day may also include the more traditional ones like sweets and dry fruits. People like to go and meet their relatives on this auspicious day to share the happiness and the feeling of prosperity. When they do that, they carry with them Pooja Thalis and ther pooja accessories as gifts and as tokens of wishing their relatives well. The gifting ideas stem out from the fact that a large portion of the day is spent giving offerings and prayers to the almighty, so that wealth and fortune never leaves our daily lives. Incense sticks are quiet popular this particular day as well. But gold jewelry for men and women is the thing to buy on Akshaya Tritiya. So go ahead, take the blessings of the almighty and lead a wealthy, prosperous life.